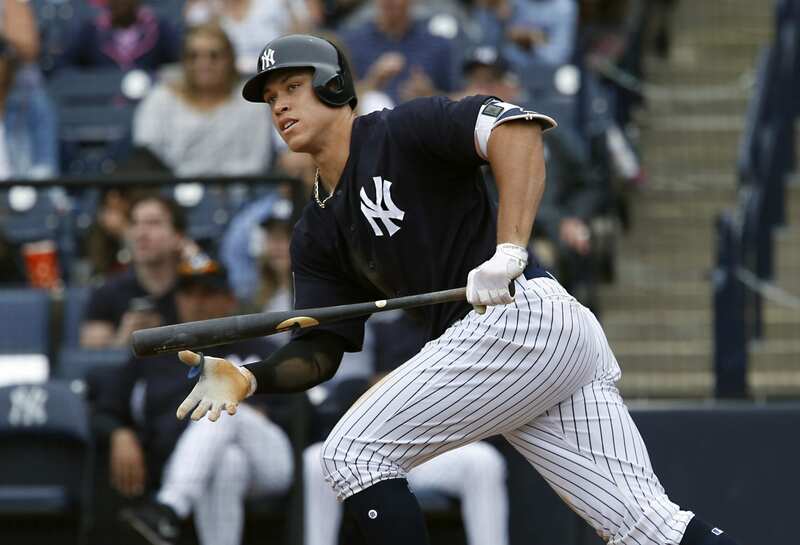 New York Yankees‘ Aaron Judge, what a true professional. There are many words that can be used to describe him, but I think classy and white-collar are the two best. Last season, Judge put together a historic run in his rookie campaign. With all of his success, he never took all of the credit, but he rather expressed his confidence in his teammates and coaches. Judges numbers: .284 AVG, 52 HR, 114 RBI, .422 OBP and a .627 SLG as per Baseball Reference. Watching what he did over the course of the 162 game schedule and in the playoffs was astonishing. Judge carried the Yankees lineup in the beginning of the season last year when Sanchez, Didi and Bird were out with injuries. Judge received the most All-Star Game votes last season for the American League with 4,448,702, according to Bleacher Report. Judge also participated in the HR Derby and emerged victorious. Aaron was the first rookie in the history of the Derby to win it. After the All-Star Break he hit a rough patch in August. The Yankees big-hitter had a .187 AVG, 3 HR and 7 RBI in August according to MLB.com. Judge picked it back up in September and proved that his first half was not a fluke, per MLB.com. The big bat had a .311 AVG, 15 HR and 32 RBI in September. He continued to have success for the Yankees in their playoff run, even though he had a low average of .188. He hit 4 HR and drove in 11 RBI in 13 playoff games according to MLB.com. Judge capped off his tremendous season with the Rookie of the Year award, an accolade he had only dreamed of leading up to the season. The rookie outfielder broke the Rookie HR record, won a Silver Slugger award, hit the most home runs in a single season at Yankee season, and set the record for most walks by a rookie in a season. Judge won AL player of the Month honors for June and September, AL Rookie of the Month honors for April, May, June and September, as per MLB.com. Going into 2018, the Yankees will display a variety of powerful hitter in Judge, Giancarlo Stanton, and Gary Sanchez.